Unemployed people in the North East are being offered a place on a unique training and skills development programme with the opportunity to secure one of over 200 new jobs thanks to a partnership between the region's biggest bus operator, Go North East, Gateshead College, and Jobcentre Plus. Developed by the partnership and the first of its kind nationwide, the range of training included in the four-week long programme is tailored towards supporting applicants seeking one of the 250 bus driver positions advertised with Go North East every year. Following a successful pilot between October 2016 and this July, which helped 45 local people into driving roles with Go North East, the 2017-2018 programme has launched with the aim of attracting 230 candidates. Unlike standard application processes, participants in the programme receive intensive training prior to interview, to ensure their chances of future employment are improved for life. Learners benefit from fundamental refresher courses in English, Maths and interpersonal skills, provided by Gateshead College and blended with critical subjects such as employability, CV writing, interview techniques, equality and diversity, and health and safety. Tyneside Training Services, part of Gateshead College conducts practical driving assessments and tuition, with Go North East delivering a driver skills training course. The award-winning bus company also provides depot tours and a company induction, alongside health and safety and occupational health training. The process completes with a presentation to mark the end of the programme. Jobcentre Plus helps to recruit applicants and covers their travel expenses for the programme as part of the partnership arrangement. To meet its ambitious recruitment target, this year Go North East is also proactively advising qualifying applicants of the opportunity to join the scheme when applying via traditional routes. 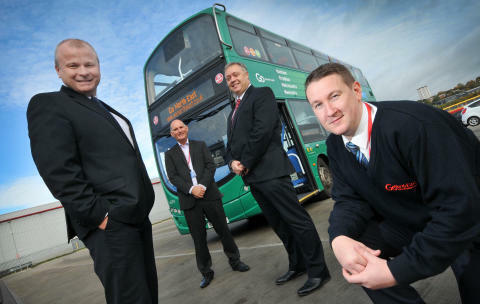 To date, almost half of those that completed the programme have been cleared for employment with Go North East to join its 1600-strong bus-driving workforce. Stephen Glendenning, from Wrenkenton, Gateshead started the programme in February, after being made redundant from his job with an engineering firm in the oil and gas industry just days after Christmas. Having faced redundancy three times and with a young family to support, the 36-year-old decided it was time for a career change. Stephen, who lives with his partner Jemma and their two children said: “My work coach at Jobcentre Plus recommended the training programme to me as I was hoping to find something secure, that offered longevity.